I quickly honed in on my hero products as the trip progressed and accepted that 75% of what I brought was unnecessary (I can hear Mr. RC saying "I told you so!" right now!). But, on the bright side, that means I can now tell you only what is absolutely necessary for a road trip beauty case, instead of this post being a million and half words long describing the hundreds of things I lugged around in my beauty suitcase. Sooooo....you're welcome?! Ok, here's the rundown of my skincare, hair and beauty faves, what I used for a quick daily makeup look as well as a few random tips. Do you have any travel beauty favorites? Gross as this may sound, I only washed my hair on our longer stops. I mean, who wants to spend an hour doing their hair when they only have 12 hours to explore a place? Yeah. no, I'll pass. Here's what I used to keep my hair looking fresh and make the process as quick as possible. Aveda Damage Remedy // When it was time to wash my hair, I'd always do it at night, then apply this cream, comb through and let my hair air dry while sleeping, and then straighten and style it in the morning. Doing this helped save on drying time as well as any additional heat damage. Phyto Straightening Balm // I swear this cream cuts my straightening time in half. You don't even need a whole lot, but it just gets the job done. By far, one of my favorite hair products. Babyliss Pro Straightener // My old straightener gave out right before we left, so I frantically searched for a suitable replacement without the $200 price tag of my last one. This one came highly recommended and, while I was hesitant as it was so much less expensive than any other straightener I'd ever owned, it turned out to be the best straightener I've ever owned (and believe me, I've tried them all). My hair never straightened faster, a serious win since we were short on time on each stop. Amika Dry Shampoo // This deserves all the credit for keeping my hair going in between washes. Oh, and it also smells heavenly! 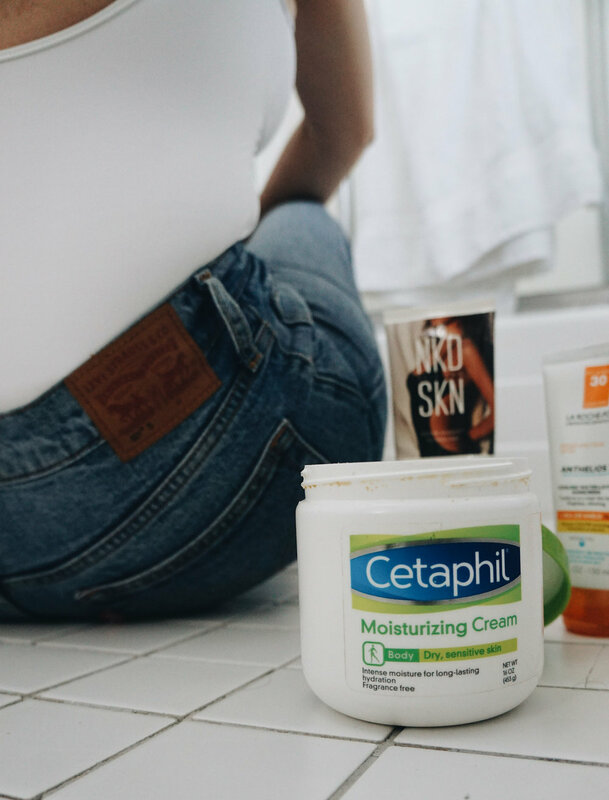 Cetaphil Moisturizing Cream // This is my go-to body lotion (my skin is too sensitive for most other ones), and continued to be my go-to even on the road, where I dealt with some seriously dry skin. I kept that container handy and frequently lathered it on throughout the day, even applying thick layers to my face as an almost leave-on moisturizing mask. My skin wouldn't have survived the trip without this product. NKD Daily Glow Moisturiser // I've been in love with this self-tanning brand for years (the scent is good, it doesn't turn your skin orange and my sensitive skin doesn't have a bad reaction to it). Normally, I do a self-tan once a week, then use this lotion to keep the color up throughout the rest of the week. To keep things easier on the drive, I just used this to make sure my skin had a little extra color. La Roche-Posay Anthelios 30 // My absolute favorite SPF! It melts right into skin, it's odorless and it's perfect for sensitive skin. Even for days that we just drove, I would make sure to apply this (because you can most definitely get burnt through a car window). French Girl Facial Polish // I love that this scrub comes as a powder (one less thing I had to worry about spilling) and it doubles as a mask. Perfect for scrubbing off long drives! Avene Thermal Water // The perfect mid-day or mid-drive refresher...my dry skin soaked it right up! True Botanicals Radiance Oil // I've been using this oil for a few months and it's safe to say I'm obsessed! I used more than I normally would while on our drive, but I'm convinced it's one of the main things that kept my skin from completely frying. Avene Repair Cream // When my skin felt like it needed something super heavy duty, I'd apply either the Cetaphil (like I mentioned up above) or this cream. It's uber thick and uber moisturizing. 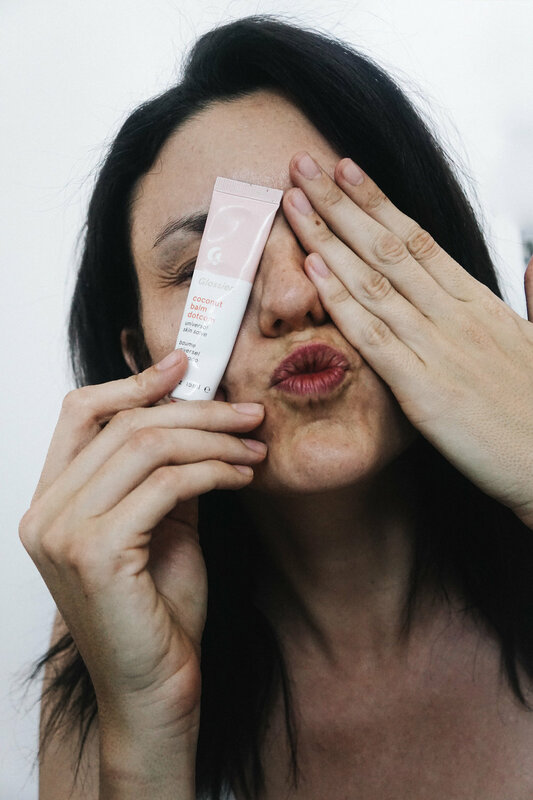 Glossier Coconut Balm Dotcom // I avoided Glossier products for years mostly because I have a hard time believing cult obsessions are much more than that. But this balm proved me wrong. I literally can't live without it now, and I certainly couldn't have made the drive without it. Total lip saver! Juice Beauty CC Cream (shade 'Desert Glow') // I almost never wear foundation, but especially not when traveling (they dry out my skin too much). This cc cream provided a nice light coverage, a little extra moisture and was especially perfect for days spent in and out of the car. RMS // If I could only use one beauty product for the rest of forever, it would be RMS. I swear by their UnCover Up (shade 11 for my eyes, shade 22 for spot coverage on my face). I also love their luminizer, which was perfect for brightening up my dull, dry, road-trip ravished skin. Glossier Boy Brow // Yup, another cult favorite that I fell hard for. Perfect for a quick brow groom on the road. Tarte Clay Play Palette // I normally try to stick to all natural makeup, but this palette was gifted to me recently and it became the perfect on-the-go makeup. I could define my brows, add a smokey eye, line my lids, contour or just add a little bronze color to my face, all without over-packing my makeup bag with tons of products. Of course, I used a few other makeup products, as well, but for the most part these 4 things were the hero makeup products that took me from the car to touring and night to day. Crest Whitening Strips // I know, so random, but long drives = not a lot to do/not seeing or talking to anyone = perfect time to do a little whitening. My teeth were at least a few shades whiter by the time we got to LA! Sally Hansen Clear Polish // I like to keep my nails looking good, but it's always hard when traveling, especially on a long road trip. So, I gave myself lots of mini car manicures and used this clear polish to help them look a little fresher (without having to worry about chips the way I would have had to with colored polish).